My grandmother took me to church often when I was a child. It was not my favorite activity. The village church, surrounded by the graveyard, was cold and gloomy, and the priest demanded too much undue reverence, I thought. As a consequence, I used to spend whole days devising plans of sudden sickness and disappearance acts before church time. One summer, I must have been around seven or eight, my grandmother told me that we would be going to a monastery in a neighboring village, and there was nothing I could do or say to get out of it. I felt betrayed by fate and bereft of hope. When we reached the Vladimiresti Monastery, I found myself in front of a tall fence of thick, whitewashed walls, over which trailed heavy clematis and morning glory vines. It was a beautiful day, with a perfectly clear sky and balmy weather, and that first image of the monastery was so perfect that it seemed almost fake, like a movie set. That trip to the monastery stayed in my memory as a wonderful experience: good food, sunny gardens, pots of red geraniums hanging on the background of freshly painted walls, and cheap cross-pendant necklaces. I used my aversion for candle smoke as an excuse to sit and wait outside, on a bench surrounded by greenery and light, instead of going inside the monastery’s chapel for the service. It was a dream. Only later I came to realize why this place had made such a big impression on me: this was a women’s spiritual house. I was too young to understand it then, but my grandmother told me at that time the story of Mother Superior Veronica who had founded that monastery. Veronica had been only sixteen years old when she had her first religious experience in the cornfield where she worked for her family. In the middle of that cornfield she saw an apparition, whom she identified as Jesus, who said to her “This be my altar!” A great light falling from the sky straight down into the earth in front of her marked the place where a new monastery for nuns was to be built, as the apparition demanded. The young girl took this as her life’s mission. Although an orphan without resources, she raised the funds to build the monastery from her visions in the middle of the cornfield. My grandfather saw her in his village’s church on a Sunday when she had come to raise money, and he told us stories about how, being only a wisp of a girl, she preached standing on a chair in the middle of the room. The building of the monastery started in 1941. The nuns that had gathered around Veronica, most of them between thirteen and seventeen years old, did the grueling work of forming and firing the bricks that were used to build the structures, while living in mud hut with no heat or insulation for two years until the building of the monastery was finally finished. Veronica continued to have visions throughout her life and became an influential spiritual leader in the area. After only twelve years from the opening of the monastery, however, she was imprisoned by the communist regime because of reports that the nuns from Vladimiresti were spreading anticommunist messages and advising the villagers to disobey the regime. 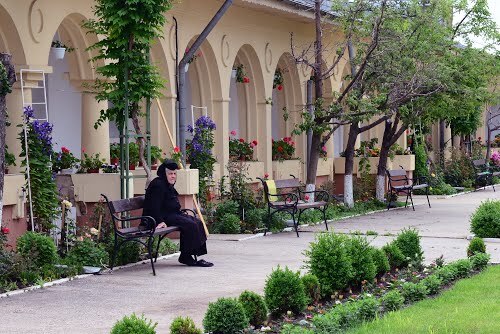 The over three hundred nuns resisted inside the monastery for one more year, even breaking away from the collaborationist establishment of the Romanian Orthodox Church, but ended up being forced to leave, while the monastery became a sanatorium for the treatment of mental illnesses. Veronica was unable to return to her monastery for more than three decades. She was back as Mother Superior in 1990, and remained at Vladimiresti until her death in 2005. An interesting aspect of this story is that neither my grandmother nor my parents remember ever taking me to visit the Vladimiresti Monastery. The place was shut down from 1956 to 1990. I was not born before 1956, and I was already old enough in the 1990s to have a good memory of the event. But I don’t. The memory is foggy and dreamlike, as if it all happened long ago, when I was just a small child. I looked at photographs of the monastery grounds and everything is the way I seem to “remember.” I don’t know where these memories come from. I was inspired by Mother Veronica’s story and used bits of it in my first novel. Being that it was fiction I was writing, I didn’t go into too much detail researching her life and work, only to discover afterwards that many parts of the story that I thought I had made up were very much true. But memory is famously unreliable, and I wouldn’t put much value on it. I want to trust my instincts that tell me I have been to this place and I have seen these things. Not that my presence there makes any difference. What matters is that this monastery and its story exist, and that its profoundly feminine spirit gives me hope. I hope that being exposed to more knowledge and more freedom of thought than a poor village girl from the 1950s, women today can create much better, much more solid monasteries where a more feminine spirituality can be embraced and can thrive. I hope they can maybe build it upon different traditions than the patriarchal, organized religions we grew up with. I hope that my own grandchildren will have access to a more motherly spiritual experience, that is more tolerant, peaceful, less threatening than many of the religions we know. I hope that the altars they build will be permeated by the fragrance of clematis and morning glory flowers under the sun, instead of paraffin smoke inside dark and moldy brick walls. Lori Tiron-Pandit is a writer, editor and translator of Romanian origin. Her work explored the lives and universes of women, with the legends, beliefs, dreams, and labors that shape them. Her first novel, Spell of Blindness, was published in 2012, and she is currently working on a second book. You can find out more about her work at http://www.loritironpandit.com. This story reminds me of my experiences at the Paliani Monastery in Crete. I think some of the sweetness comes from the nuns coming from the local area. Paliani is also on the “own-rhythm” rather than more rigidly controlled systems of monastic life. I just googled Paliani and, wow, what a beautiful and interesting place. I found particularly inspiring the tree worship aspect, apparently inherited from the ancient Minoan spiritual tradition. Yes Paliani is a magical place. Lovely post, a bit of magical-realism-feminism for us- a treat! What a moving, beautiful, true (literally and poetically) story. Thank you! Some of the women’s monasteries in the US and Canada seem to be fulfilling that dream of ” better, much more solid monasteries where a more feminine spirituality can be embraced and can thrive.” Wish there were more. I am fascinated by your experience of knowing a place you hadn’t physically been to. There are energies in creation, and in our own brains, that we haven’t even begun to explore. Thank you for sharing. I know! Nuns all over the world have been trying to make a difference for a long time, although their work has never been of much prominence. They deserve a lot of credit for how they managed to work from within very patriarchal religious systems. As for the strange experience of “knowing” things before you actually “learn” them, it is indeed fascinating. I try to not make much of it and think it’s trick played by my memory, but even if it were so, there are some signs there to consider. Very interesting. Thanks for writing this. But I didn’t understand that you were talking about Romania until I came to your bionote at the end. Is what you’re telling us a story about life under the rule of the tyrant Ceausescu? I’ve just read a book of stories by Norman Manea that tell what life was like for men and women. (He was expelled from Romania in the 1980s.) In the context of communism, your story of Mother Veronica and the nuns is even more interesting. I’m glad they got their monastery back! You’re right, I should have mentioned early in the article that this was a Romanian experience. Yes, this happened before and during Ceausescu. Veronica spent about nine years in jail but could only return to the monastery after the fall of the communist regime. I haven’t read Norman Manea’s book, but it does sound very interesting. On not knowing where the memories come from. I have a theory that I am living a life I’ve lived before, but I’m doing it over again so I can improve on some parts of it. I often know things about the future, especially where the stumbling blocks will be, and so I take some detours ahead of time around those things. Some difficulties you can’t avoid, though, and you have to go through them, and I think that’s because the learning is not always a question of changing the situation but accepting things as they are appropriately. I never thought of it this way, but it does sound like a perfectly valid theory to me. I only wish I lived my life with so much awareness!